I have mentioned before our vineyards are on the slope of an extinct volcano. And so it goes to reason that the land has… well a bit of a slope. The soil on volcanic slopes are often prime and ideal places to have a vineyard (assuming, of course, other factors such as local climate are also conducive to growing grapes, else Iceland would be awash with wine). But these soils tend to be unstable. Our land is a mix of loess and clay on a volcanic under layer. And on slopes such soils do present a problem for farming because most vineyards do have some degree of soil tillage and such soil disturbance can lead to erosion from both water and wind if done improperly. If a slope is very steep, and the soil is very unstable, the farmer’s greatest problem in regards to soil erosion is water mainly from rain. The ancient and time honored solution to this problem of course has been the terrace. And to terrace land requires building terrace walls to hold back the soil in order to make the flat spots to perform agriculture. The most famous of vineyard terraced land is probably the Austrian Wachau Valley wine region along the Danube River. Hungary has less need for excessive land terracing, but it is still used to some moderate extent in our wine region due to many vineyard extending up the slopes of the numerous volcanic hills. 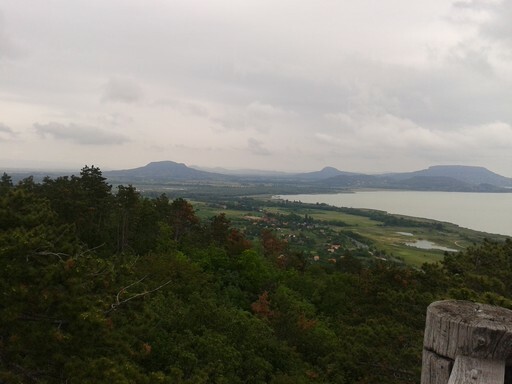 Volcanic hills of the Badacsony wine Region by Lake Balaton. The modern terrace wall is usually made of concrete. This is a cheaper solution than the traditional method and much easier to install. Concrete terrace blocks are a simple to install, DIY method to build a terrace wall. The traditional method of course is to use stone. And living in a very traditional region, approaching two millennia of continuous wine making history, I had to go with the traditional method when it was decided to build new terraces. To build a stone wall requires a skilled master stone mason. There is no cement used to join the stones. Each stone must be shaped with a hammer to fit. With just a blow or two with a hammer a master stone mason can get the rock to break in the way he wants so it fits properly into the needed space. It really is a fascinating process to watch. This is definitely not a DIY project. Below are a few images of the work in progress on our new terrace walls. Stone terrace wall under construction. The stones in the foreground will be shaped by hand with a hammer to fit into the wall, without using any concrete between the stones. Stone terrace wall under construction. A simple string is used by the stone mason to keep the wall straight as it is built. The same stone terrace wall under construction shown from a different angle.